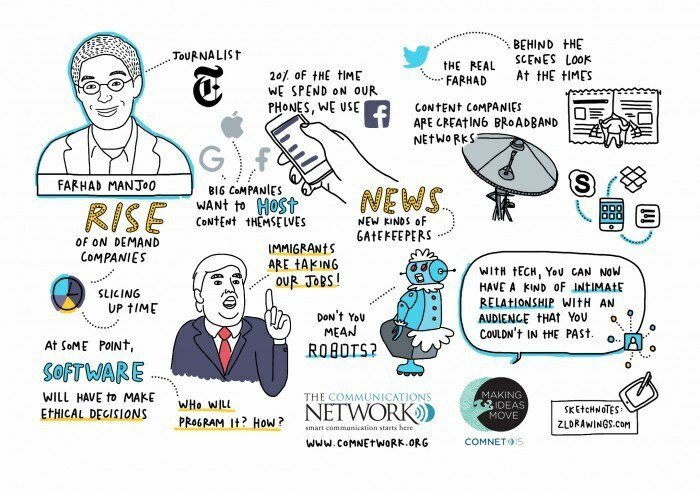 Farhad Manjoo, tech columnist for The New York Times, sat down with Network Board member and Knight Foundation Vice President of Communications Andrew Sherry to discuss the future of how we communicate, the disruptions to come, and whether or not robots will take your job. Farhad is going to be joined on stage by our moderator for the conversation, Andrew Sherry, vice president of communications for Knight Foundation, who I’m sure many of you have had the chance to speak with over the course of this week. You can follow along with both of them on Twitter — although I assume you guys are not going to be tweeting too much while you’re talking to each other … it would be impressive. 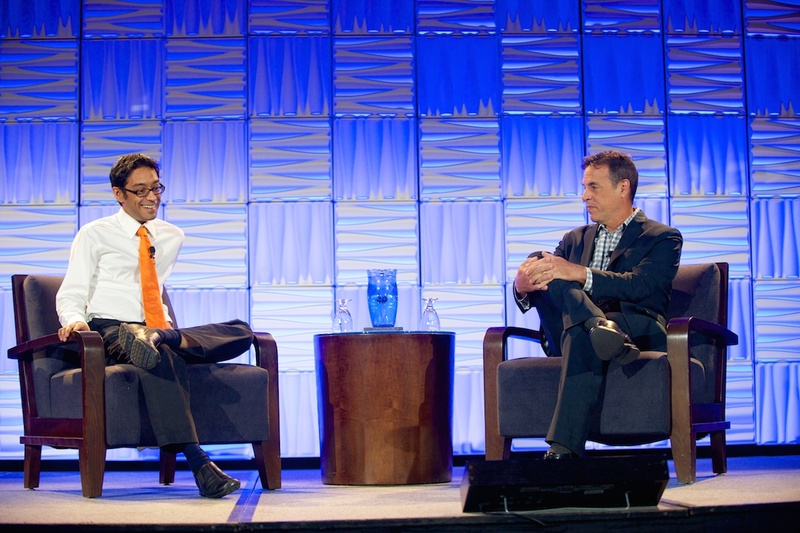 Please join me in welcoming Farhad and Andrew, and thank you all for a wonderful conference. It’s been so wonderful to speak with all of you over the course of this week, and I look forward to the chance to speak with those of you I haven’t had a chance to talk to yet over the next couple of hours before we all head home. Thank you again and welcome to Andrew and Farhad. Andrew Sherry: Thanks so much for that nice introduction. Farhad Manjoo: Yeah, thanks. Hi. Hi everybody. You mentioned Farhad’s columns. In your columns, you are mostly serious, but on Twitter you have this very quirky personality, and you’re often frankly quite hilarious. What I want to know is: Which is the real Farhad? The Twitter Farhad is the real Farhad because there are no editors on Twitter. It’s just the unfiltered me. I often think that what I do on Twitter is like the realest version of what’s going on in my brain. It’s just the most unfiltered. Some people think what I do on Twitter is a persona, like it’s fake. That it’s an act, but it’s not really an act. It’s like sometimes I say dumb things on Twitter because I actually had a dumb thought. I would say that is the more authentic version of me. The medium really does affect the message, though? How do you think of those two things differently? Yeah. What I do in my column is a very formal, structured … it’s argumentation. I read a column about technology and society and how technology is changing business and what we’re doing, and usually it takes the form of some kind of argument. This is good, this is bad, and this is how things are going to change because of this. It’s a very structured thing that takes me a while to write. It’s not tossed off. Hopefully it’s good. More people, I think, read it than read the tweets. Twitter is just — much else I do online — it’s just much quicker and it’s faster and it’s less considered. Hopefully it doesn’t get me fired at some point. It could. Probably many of the people here have spent the last five years persuading their organizations to get comfortable with social media. Are we being too earnest and too serious on social media? It depends on who you are. Some people are having a lot of fun. I’ve been working at The Times for a year and a half. I’ve been reading The Times since I was a teenager. For a long time The New York Times as an organization was just this very opaque place. You saw bylines but you didn’t know who the people who were creating these amazing things, who they were, what their thoughts were like, what influenced them, and all of that should be part of the experience of reading The Times. My goal in Twitter — what I do in Twitter and increasingly like Snapchat and other places — is to give people a sense of who I am and sometimes a behind-the-scenes look at what we’re doing, what eventually ends up in the column. It’s to remove some of that opacity so that the people who follow me on Twitter and then read the columns get something deeper, I think, from it than the people who just see it in the newspaper and read it. I said that you were mostly serious in your columns. Sometimes you’re not so much. Your last column for Slate was a very compelling argument why men should wear makeup. I have to ask in the spirit of full journalistic disclosure: Is this the real self, or are you wearing makeup today? I am not wearing makeup and I should be. I think you’d appreciate this talk at least 10 percent more if I was wearing makeup. I’ve been on TV. Whenever I’m on TV they put makeup on you, and I look much better. It’s really strange that men don’t wear makeup. It’s really strange that the same kinds of incentives that compel many women to feel like they have to wear makeup don’t apply to men. For this column I visited a makeup artist who made me look much better. The only reason I don’t do it is because I have two children, and it would be a lot of time, but just a little bit of makeup would be great. So, we’ve established that we’re getting the unvarnished Farhad today. Tell us a little bit more about yourself. Communications professionals and journalists — they have different objectives, but actually many of the ways that we actually work are quite similar. Tell us, basically, how you work. What tools do you use to make yourself more effective, more productive … how you both are consuming information and how you are creating information? My basic task every week is to write one column. The way that that works is I read everything that’s going on in the tech industry. I use a lot of tools. I use the common ones. I visit a lot of websites. I use some aggregators that follow tech news, like this site called Techmeme, which boils down everything that’s going on in the tech industry to a few headlines. The most important way that I come upon news stories these days is Twitter. I’m just constantly following Twitter, finding news and reading it and linking it out and sharing. It’s like the Newswire in a way. Like people in finance, I think, look at Bloomberg and I look at Twitter. Being on Twitter, it’s not procrastinating? I wonder about that. It’s both, and it certainly occupies a lot of my time. Hours and hours. The amount of time I spend on Twitter way dwarfs the amount of time I spend writing a column. I have come upon news stories … important column ideas from Twitter — like connections on Twitter — and probably one of the reasons that I’ve gotten my last several jobs is because of a networking effect that has created. I would say it’s been hugely important to what I do on a day-to-day basis and my career at large. It’s also often a waste of time. Right. What else do you like to use? On the hardware front, can you show people that your band of your Apple Watch actually matches your tie? That’s interesting — I just noticed that. That’s pretty impressive. Yes, matches the tie. I’m still unsure about the Apple Watch. It’s nice. It’s interesting. I have worn it every day since it came out a few months ago, but I’m not sure it’s something that most people need. I’ve written this other tool. I use a bunch of various kinds of organizational software. I use this tool called WorkFlowy, which is an outlining tool that I use all the time to jog down; I mean I write all my notes in it. I record my phone calls for notes, and I use Skype to do that. I use Dropbox to make sure I have everything everywhere. I use Apple products a lot. I’m a cliché in that way. What do you see coming down the road? We’re all interested in the future of tech and the future of communications, but you actually … for a living … you’re able to be trying to look at the technology landscape and how it’s changing. What do you see? We’ll start on the personal level of how we work and then maybe go bigger from there, but what do you see as the technology developments that are coming down the road that are most likely to change how we work, to start with? How we work as communications professionals? I think what seems to be happening is we’re seeing an acceleration of the trend that has been going on for a while, which is these huge platforms like Facebook and Twitter and others are becoming a more and more central part of how people get their news and get information. That’ll become just an even bigger part of it. Facebook is now … something like 20 percent of the amount of time that people spend on their phones, they spend on the Facebook app. That seems to be growing. I think the second or third time spent is Instagram, which is another Facebook property. WhatsApp is also huge. Basically all of the Facebook properties are very responsible for all of the time we spend on our phones, and I think that share is going to get higher and this one company will be responsible for an ever greater share of the amount of information we get. What do you think that will mean for us? It means a couple things. I don’t think it’s necessarily a terrible thing. Some people in the news business think it’s a terrible thing. What seems to be happening is that it’s first of all bringing a bunch of news organizations — and other kinds of people who need to communicate — much closer to their audience in a way that really wasn’t possible before. You can now have something like an intimate relationship with an audience that you couldn’t in the past. What I’ve noticed is, if you think about something like Procter and Gamble, which spends tens of billions of dollars on advertising on a set of brands to get us to think about these brands … it’s core to how we perceive the world. Things we can never forget. Procter and Gamble does that mostly by blanketing television with ads. It’s costly, but it creates this deep relationship. In the future, I think what’ll happen more often is we’ll get smaller brands with which you have deeper connection, that come out of nowhere and that don’t require tens of billions of dollars. We’re already seeing it with consumer products. There are a whole bunch of new men’s shaving products like Dollar Shave and Harry’s that have come about and are competitors to a huge multibillion dollar brand like Gillette only because they’ve used social media really cleverly and they’ve come up with new business models. They say they’re cheaper, and you see them in your Facebook feed every day. That has created these brands I don’t think Gillette would’ve looked out for a few years ago. If you’re a marketer, you’re going to live, breath, sleep data. If you’re a journalist, how much attention do you pay to analytics with either your column or what you’re doing on Twitter? The Times has for a long time discouraged this idea of reporters, the people who were writing this stuff, getting access to the data. For pretty solid ethical reasons — like if I’m writing with looking at, like, traffic data — it’s probably going to skew what I write. That’s changing a little bit at The Times. We now get a daily audience report that tells us — not very granular detail but enough that it’s interesting — which stories did well and why they did well and where traffic came from. When I worked at websites — I worked at Slate for a long time — we would get much more information, and it would be both important and useful, like I knew what worked, and I knew what didn’t and would sometimes write to what worked, an important tool in deciding what columns to write. On the other hand it would make me crazy. If I wrote something that wasn’t popular it would just ruin my day and ruin my week, often. I think there’s a bliss in being a little bit ignorant of the traffic. You can just do whatever you think is important and sometimes not worry. It’s still — even if you don’t have access to traffic — I still pay attention to how many people are talking about my column on Twitter. Just in a rough sense. If people are talking about it that makes me happy, and if people aren’t talking about it I get very sad. Earlier you mentioned the rise in power of the platforms. I was just at the Online News Association conference in Los Angeles, and one of the keynote speakers was the head of Google News. Honestly, I had never seen Google on the defensive, but they are on the defensive because now that the Web has gone almost entirely mobile, there’s not an open Web on mobile. It’s you’re going through one of the pipes. You’re going through Facebook mostly. They have this death grip on the mobile, and now Apple is doing ad blockers. At the same time he intimated that Google and perhaps Twitter had a counter-attack strategy. Do you know anything about that? Do you know what we could be expecting about this battle for the mobile consumer? The huge change, as you say, is in the past many of us got our news — in the past, not in the distant past, but basically in the past decade — we’ve gotten our news through the Web, and the Web is pretty quickly going away. It’s going away in that people are getting the Web on their phones, and to access it you need to go through Mobile Safari or an app like Facebook that opens up embedded Web pages. Both Apple and Facebook are changing what that means. For Facebook the problem is that when people link from the Facebook app, it’s a pretty slow process. Everything else in the Facebook app works quickly and then you open a link, and it grinds to a halt because the Web is inherently slower. It’s also clogged full of ads, which also slow down people’s experiences. Facebook has launched this thing called Instant Articles, which just makes a new story load up much more quickly. That’s because Facebook is actually hosting the content itself. The content is part of the Facebook app technically in a way that a Web page is not. Apple is doing that. In its new iOS it has a news app that does that. Apple also in iOS 9 is allowing people to block ads, which also affects the economics of the Web. Google’s plan — from what I know — is to do something similar, which is to host the content itself and to make it load up more quickly, and is partnering, I think, with Twitter. A link that you open on Twitter would load up in a faster way than it does now. What this means for big publishers is unclear. The New York Times has signed up with several of these. You can get New York Times stories from Instant Articles on Facebook or Apple News, probably from the Google system. They all have ad breakdowns so the revenue will be split, and it’ll work out. What it means for smaller publishers is less clear. There could be a whole bunch of smaller publishers who think of the Web as their main access point for their readers right now who will have to move onto these new platforms, and it’s unclear if their business models will work on these new platforms. It is — as ever — this period of transition for the media business. I think this period of transition for the media business will never end, at least not in the next decade or so. Let’s shift from media to technology and politics. What we’ve seen in the last few election cycles is increasingly more targeting and use of big data to be more effective in outreach to voters. How are the campaigns going to top what they did in 2012 now that 2016 is coming along? I think we are seeing more and more spending on digital campaigns, but I think that there’s going to be this huge amount of money being spent on TV. Even though the audiences for TV are shrinking over time it’s still the way you get the biggest chunk of people in an effective and engaging way. I think we’re going to see more spending on video political campaigns than we did in the past … video ads online than we did in the past. The other thing that you’re seeing that you’ve mentioned is targeting. There’s greater opportunity now to combine online targeting with offline targeting. You show someone an ad on Facebook or an ad served by the Google network, and you also have an actual canvasser going door to door to that same person. There are ways to connect those databases. I think the Democrats in particular are good at that and have this data to do that. I think we’ll just see an acceleration of that trend. Each four-year cycle brings new tools and new innovations to this. Every time it requires more money, but you see greater effectiveness from these kinds of digital campaigns. How about a look ahead — not just at work, media, the things that are right in front of us — but big picture, what do you see as the biggest technology changes that are coming down the road, that are going to have the biggest effect on our lives, on the economy? Basically on how we live and work? The biggest story that we are covering in the tech group of The New York Times for the past — at least a year — has been the rise of on-demand companies like Uber. These are companies that use smartphones to deploy people in the real world to do stuff in the real world. It’s a major transition from what we were doing with technology a decade ago, which was mostly software and changing how people communicate online. Now we’re changing what they do in the real world. That’s going to bring all kinds of changes. The big story with Uber is that, Uber is this transportation network that gets people to drive, and it routes them with smartphones. It routes riders and drivers with smartphones. What they’re doing really intelligently is slicing out amounts of time and people and creating these little mini jobs for people. You can see that happening in a variety of different kinds of occupations. There are things like Uber for lawyers and Uber for doctors, which is like you need a doctor for a specific short amount of time — maybe to come to your house or maybe to perform a certain function — and you pay for that amount of time. You slice it through software, and you manage it through software. There is Uber for lawyers too. It’s going to change various kinds of business models. What we’ve noticed Uber doing for many of the drivers is it allows them to work at any time, and Uber is, for a lot of them, just this in-between job. They need a little extra income, and so they do it at off hours or extra hours. You’ll notice that happening in many different occupations. The whole idea of downtime now seems a little antithetical because you can just profit from downtime anytime you have. Anytime you’re not working seems like an opportunity cost because you can log onto an app and start making money immediately, whatever your profession is. What do you think the overall impact on society is as these jobs proliferate and other ones go away? Are they just opportunities to make extra money, or are you creating armies of people with no benefits, no retirement plan? Does it matter? Can anything be done either way? Things can be done. There’s a controversy about these contract jobs. Uber has hired hundreds of thousands of people around the world, but many people in the labor movement think they’re not good jobs. There’s both a court fight and a larger public policy debate about whether these people should get benefits and whether we need some kind of different organizational model. They seem to be somewhere between contract workers and full-time employees. Should we have some sort of intermediate model there? The other thing to think about, though, with these new kinds of jobs is that they may go away very quickly — just as quickly as they materialized. You can see Uber’s jobs being eliminated through automation over time. As cars get smarter and can drive themselves more often … one way to think of Uber jobs is the drivers for Uber are doing the last thing that computers can’t do in that whole system. As computers can get smarter, those jobs will be eliminated. It’s happening not only and not even mainly for low-income, low-skill jobs, but for middle-class and higher-skill jobs. It actually makes more sense to work on automation to replace a lawyer or doctor because those people are costly. My wife is a pathologist. She’s a doctor who looks at cancer cells on slides and diagnoses them. It’s just like pattern matching that software can do very easily. Yeah, I’ve told her that. We have this conversation all the time. The reason that it’s not done with software now is because the software is not quite good enough, but over time it will be good enough. It’ll get good enough within the next 10 years. I’m not picking on my wife. There’s software to write news stories too. My job is going to go away at some point. Hopefully not my specific job, but a lot of people in my industry will be automated away. It’s interesting. I think that a lot of people … we see in the Republican political campaign so far a lot of people are really focusing on immigrants taking people’s jobs. Robots are the much bigger threat here. We should be building a wall. If we’re building a wall, we should build the robot wall. You mentioned self-driving cars, which I do hear more and more. Seems like an inevitability because basically they drive better than we do. Joichi Ito, who is on the board of both my foundation and The New York Times, talks about the ethical decisions that lay behind artificial intelligence. The way it says is, okay, you’re riding your self-driving car down the street. … There’s an old 2015 human-driven car that’s veering in the wrong lane because humans are fallible. You have two choices, this self-driving car: Do you smash into it and maybe die, or do you swerve to the side where there’s a father and three kids on the sidewalk and kill them? When I asked the survey, most people respond. They’re like, definitely just smash and avoid hitting the children. Then they asked the question … it’s like, would you buy a self-driving car that was programmed to smash and kill you rather than going up the sidewalk and killing the kids? They were like, I’m not quite so sure. The question it brings up, though, is as more and more of our lives and our world is going to be decided by algorithms — like credit scores are done now — who does the deciding? If you feel that you’ve been treated unjustly, who do you protest to because there’s no way to figure out how the decision happened? Yeah. It’s going to be a bigger and bigger problem. Software will have to, over time … as it becomes more important to our machines and our daily lives … it’s going to have to make ethical decisions. Someone is going to program those ethical decisions, and it’s not quite clear yet whether the person that programs those ethical decisions into software will be regulated … whether regulations will apply to that … whether it’ll happen in secret. We’re already seeing algorithms decide a lot of things. The way that your news is presented to you on Facebook is decided by algorithms. There’s no kind of oversight of that. Facebook is a private company, and it has First Amendment rights to decide editorially how it wants to present news to you. It’s a huge change from humans doing it. That will happen more often. I could imagine a software company and a self-driving car company arguing that it’s a First Amendment copyrighted decision — what their software is doing in a car. We’re seeing it with Volkswagen. Their software violated regulations. It tried to cheat regulations, and it may’ve harmed real people out in the world. It’s not quite clear that higher ups at Volkswagen … it’s not obvious that they had to know about it. It only takes a few people to program an engine control unit. Some group of people could’ve done that in a small way and affected this whole company and all of the repercussions from that. That’s the power of software — you don’t need that many people. That’s moving quickly — and, of course, in biochemistry, that’s moving quickly our ability to create life in test tubes and things like that — but where’s the ethical framework around that as well? I just wonder, we all work for organizations that are trying to make the world a better place in some way, but a lot of it is basically responding to existing problems and trying to help them. Is there potential for some issues and some problems coming down the line as a result of our technology advances that could end up being far worse than anything we have now as well as our ability to do far better? Is there a role, perhaps, for the independent sector — or whatever we call the nonprofit world — to actually be thinking about ethics and playing a role in ethics? I don’t think that there is really, at this point, this well-established group in the way there are bioethicists and groups that think about bioethics. I don’t think there is that analog for software, for artificial intelligence and how artificial intelligence is going to change the world for the better or the worse. I think there should be. It seems obvious that this huge force that’s probably going to change a lot of what we do … that there should be groups on each side agitating for and against it. Not only agitating, just thinking through these problems. These problems, I think, exist now in the realm of science fiction, and science fiction authors have thought about this, but science fiction is quickly becoming reality. It hasn’t filtered down to academics thinking about it or think tanks thinking about it and creating solutions for potential problems. We want to take questions from all of you now. There are some microphones. If you want to ask a question, put your hand up, and someone will come with a microphone. Then if you could please stand up, say your name and where you’re from, and ask the unvarnished Farhad anything you’d like to. Sean, if you don’t mind helping me call the people. From here I can’t actually see. Raul: Hi there. My name’s Raul Audelo. I work at Earthjustice. I’m a senior Web manager. My question is in and around this idea of mobilizing movement to get out and vote and get voter registration. There’s countries that are using technology to get high levels of participation from their citizens that reach higher than what we’re doing here in America. Beyond making it a national holiday and getting folks out to vote, how can we use technology — we all have cell phones, we all text message — how can we leverage that to increase the numbers of participation? This was 2008, and in 2012, I’ve seen some pretty good studies about both smartphones and social networks that were used to increase voter participation. Political scientists have noticed for a while that frequent contact with voters in the months and years leading up to elections helps those people get engaged and eventually increases the voter rate. If you could imagine that a tool like Facebook could both identify and then — through offline ways — tell you who to contact as part of a canvassing campaign, much earlier on and in a cheaper way than in the past, that could increase the likelihood of those people voting. Then, tools like mobile notifications and text messaging on the day of the campaigns … there have been various small studies that show that that increases the likelihood that people will vote. Also the inherent peer pressure of Facebook seems to work. When a lot of people say they’ve voted that pushes other people to vote. It has this effect of suggesting that it’s something you should do. The big story — these aren’t completely novel methods — but I think the bigger idea here is you can do it at scale in a way that’s cheaper than what was possible in the past. Raul: Of being able to vote directly from your device? Yeah, I think that was a dream in the early days of the Internet, and I suspect that it’s going to be a very long time if, like, never, that will be able to happen. People are just very worried — I think, justifiably — of the security of online interactions. You have this huge problem of, if you vote through software you have no idea if the software is correctly registering your vote in a way that seems like … it’s not completely solved with paper. You can do that with paper. Somebody could take all the ballets and change the votes, but it’s just much more difficult. With software you could do it at scale, and foreign powers could do it at scale in a way that is inherently scary. Eric: Hi, Farhad. Thanks for being here. Eric of Imagine Institute, San Diego. I’m curious about something. In the old days — I guess 10, 20 years ago — the content of the news was controlled by big corporations. It seems to me there’s been a democratization of it because the barriers to access are lower. How do you think that affects the content and the stories we’re hearing and the stories we’re telling? Both things have happened. It’s more democratized in terms of what’s created. There are no gatekeepers now to the kind of content that’s being created. On the other hand, there are still huge gatekeepers in terms of … if you look at where people are getting their news, you see gatekeepers. Google and Facebook are the obvious ones. Google search algorithm is both personalized, and it’s created by this software company whose algorithm is secret. You don’t really know, and it’s not quite clear where it’s steering you toward. That’s obviously some kind of gatekeeper. Facebook and personalization generally, many people have argued, reinforces your own interest and beliefs and sometimes cuts out the access to alternative views. You have this strange thing where there is more information now than ever before and potentially you can access it. Potentially you can get more opposing views than you could in the past. In practice it’s not quite clear that that’s happening because we’ve replaced the ones that have gatekeepers with a few other kinds of gatekeepers. We still have to wait to see how it all shakes out. I feel like I have to work a lot online to get all kinds of news, to get access to many different kinds of stories. It still is not a thing that is automatic. You have to do a lot of investigation and research to get all the points of view around a story, and it’s very easy to get into a bubble on various kinds of things. Eric: You were actually the first one to write a book about that, about the post-fact society, even before the filter bubble came out or the information diet. Which way do you think the trend is going? I go back and forth. I don’t have a firm answer on this. Part of the problem is that there is new technology all the time that’s changing how we get our information. It’s a little difficult to say, like it’s going in one direction or another, because tomorrow some new thing could come around and change how we get our news. It seems better now than it was a few years ago. I remember between 2008 and 2012, it seemed like it was easier for false stories to get out and stay and persist in the media. Now, I think tools like Twitter and Facebook are better at surfacing stories that run against your preconceived lease, and also the news is much better on picking up things that float up on Twitter. Twitter seems very good at getting the other viewpoint out there. We’ll see how it changes. Andrew Sherry: We’ve got someone with their hand up in the front. Lauren: Hi, Farhad. Thanks for being here. I’m Lauren with the Omaha Community Foundation in Nebraska. I’m curious — you started to touch on it, but you still do a lot of digging throughout the Internet for the information, and I’m curious about the role of media conglomerates such The Times, The Post, things like that. Where do you see them and the role they play as technology continues to advance? The kind of companies that were traditionally media companies, like the cable news companies and newspaper companies like The Times and The Washington Post, they have a lot less power in this environment. It’s the tech companies that have more power. The tech companies control the devices that we use to access information, and they control the software that guides us to that information. Apple, Google and Facebook — and Amazon to some extent — are in control of the movies and TV and the news in a way that … The New York Times will never have that sort of control. They are dominant in every aspect of how we interact with media. It makes sense. Software is such an important part of the world economy that it would make sense that software companies — rather than information companies — are going to be the future arbiters of this. Allison: Hi there. I’m Allison from the Annenberg Foundation, and thanks for being here, Farhad. I’m curious what your prediction is on how virtual reality is going to change the media landscape and storytelling in general from a communication standpoint. We’re looking at it really closely as something to bring people closer, obviously, to the realities of a story or a situation. I’d love to hear what your prediction is … and also not just in media but our behavior as human beings with one another, real time? I’m totally optimistic about virtual reality. Every time I use it I’m surprised at how good it is, and it seems like the kind of thing that’ll be … there are tech barriers. The technology has to get smaller and cheaper, which will definitely be satisfied, and at some point it seems like it’ll be the kind of thing where everyone will use it. It will be the next television. It’s so engaging and so absorbing. People talk about TV as being addictive, but I think virtual reality will actually be like drugs. It will be impossible for us to disengage because what you’re essentially doing is creating a very realistic environment that is flexible, that is programmable. It seems unlikely to me that it’s not going to become the biggest thing. The question is how long it’ll take and what the business models will be and stuff for this. It’s no surprise to me that Facebook was that interested and paid two billion dollars to buy Oculus because the whole idea of interacting with other people over text as we do now seems a little bit like one step away from true human experience. When we talk to other people, we talk to them face to face, and the way we do it on Facebook is like putting one step between us and other people. In the future, virtual reality will erase that one step, and you’ll be able to do it just very much like how you do it in real life. Yeah. Does that answer your question? I’m just totally optimistic about it. That’s the answer. Katie: Hi. Katie from the Council of Michigan Foundations, and for someone who’s not in the tech space, I’m hoping you can frame up net neutrality and let me know if you have a position. It used to be an easy thing to describe because what it originally meant was this idea that the companies that are providing the pipes — like the broadband companies that are providing the way for us to get access to the Internet — wouldn’t have a business model that allowed them to dictate the content. Comcast as your broadband provider couldn’t sign a deal with Disney to say you would only get Disney channels on your Internet or that non-Disney channels would be slower in some way. That was an easy way to describe it. What’s happened over time is that the way that we get the Internet has become so complicated, and there are these fundamental questions of how you pay for stuff that I think are interesting. For example, one of the things that’s happening is content companies themselves, like Facebook and Google, are creating broadband networks. Google is doing so in the United States with Google Fiber. Facebook and Google are creating these huge satellites and planes and other things to serve broadband to developing countries. In those areas, they are in various ways interested in preferentially serving their own content or other people they sign deals with. You could argue that violates network neutrality. The other thing that’s happening is broadband companies are themselves getting into the content business. Over time, it seems the broadband business is becoming very much like the cable TV business. You’re going to sign up for a broadband and you’ll get some channels on it. You’ll get some services on it as part of a bundle, and that’ll just be how it is. You’ll pay for content as part of broadband. Also it seems like there have been some huge regulatory moves to limit this, but the business is becoming so complicated that I’m not sure that the regulations will stop the kinds of things that the people who are for network neutrality were worrying about at first. Andrew Sherry: Yeah, I see a hand up there. Rebecca: I’ll start with my first question, although that brought up a different question. My name is Rebecca. I’m with Community of Broadband Networks Initiative with the Institute for Local Self-Reliance. I’m wondering — as someone who works for The New York Times — what do you feel your role is as a gatekeeper, and how do you encourage alternative voices in your posts and that sort of thing? The way that I think about it is just the ethics of journalism. I write an analysis column, but I try to be intellectually honest and get all the points of view in it. I don’t want to set up straw men, and I don’t want to not give people their say and defend themselves and stuff. It’s just part of the ethics of discussing things. The reason that it’s difficult to talk about The New York Times as a gatekeeper anymore is I’m not even sure that we do serve that function. We give a certain imprint of importance to some people. If they’ve been covered by The Times then they’re important in some way, or companies or brands or whatever. That’s much less so than in the past, and also if we do it incorrectly — if we cite a source who is not supposed to be cited … is a quack of some kind — then we called on it very easily, and people make fun of us, and it’s bad in a way that it wouldn’t have been in the past. There are people watching our role and seeing if we’re acting as correct — as honest — gatekeepers and aren’t in a way that wasn’t before. Andrew Sherry: The question was: What do you feel about business models like The Huffington Post, where people work for free? Not all of the people of The Huffington Post work for free. I think mostly the bloggers that work for free on The Huffington Post are doing it for other things. They’re doing it for attention to their cause or because they’re celebrities and they want to be known for some other things. In general it’s really great that there’s a lot of experimentation and business models in the media. For a long time, the thing that happened in the media business was people were thinking this is going to fail because the current business model is changing, and there was very little experimentation. Now what’s happening is venture capitalists and other investors are pouring a lot of money into various new online news start-ups, and some of them are finding new ways to pay for the content and it’s working. BuzzFeed has this model where BuzzFeed acts as a creative agency … creates ads that then go onto social networks and do really well and pay for hundreds of journalists that they’re hiring. All of this experimentation and creativity I think can only be to the good. Some of these models may not work. A lot of them might not work, and some of them may strike people in the legacy media business as a little bit like something we shouldn’t be doing, but I think it’s good that people are just trying new things. Andrew Sherry: I think we have time for one last question. Betsy: I have the microphone. Hi, I am Betsy from the Philadelphia Foundation. I’m glad you’re here. What hope is there for the technology have-nots? Not just people from a financial standpoint but from an age standpoint and from a rural lack of wireless access? Do you see any hope for those folks or have they already gotten so far behind that it’s going to be impossible to catch up? No. I think there’s hope. I don’t think they’re impossible to catch up. Just from the financial standpoint, wireless Internet is changing everything. Mobile wireless Internet is allowing people in places … where it seemed not possible to create Internet signals, it’s going to allow them to get the Internet. That’s happening because big companies are spending billions of dollars to get them the Internet. Then, from the people who don’t know how to use this technology, that’s also getting better. The huge change between the iPad and PC is that the iPad is something that my two-year-old just intuitively understood how to use. Mobile software is just much easier to use and maintain, and there is a lot less that you have to worry about in terms of bad stuff happening than on a PC. I think that trend is going to continue. We’re moving toward a place where software and computers are more like appliances. They’re more like your refrigerator than they are like your computer. Computers are going to be like cars. You don’t need to understand how the car works to use the car. That seems to be happening in software. Andrew Sherry: That’s a nice positive note to end on. Farhad Manjoo. Thank you so much for being with us today.